Just two races into the 2016 World Triathlon Series season, and this weekend will mark a potentially career-defining day for two of Great Britain's most successful ITU athletes. 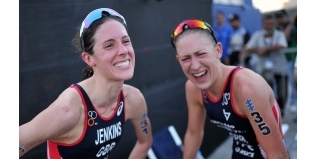 With the automatic selection of Non Stanford and Vicky Holland from their results at the 2015 Rio Olympic Test Event and Chicago Grand Final, the World Triathlon Gold Coast looks set to be a head-to-head for the final slot between Helen Jenkins and Jodie Stimpson. The race takes place this Saturday, 9th April (live on the BBC Red Button and online, 00:30-02:30), with notification of selection, courtesy of the Olympic Nomination Policy amendment due by 18th April for the women's team. In practice, let's hope that selection decision is clear cut almost immediately. So, what do we know... or can reasonably imply...or is just our (reasoned) opinion? The WTS Gold Coast is the defined '2016 Assessment Race'. Helen Jenkins and Jodie Stimpson are the only female British entrants for the event. While the selection policies still have contingency for a 'Pilot Athlete' selection (athletes selected as helpers, who's primary role is to assist the medal winning chances of their team mates, previously known as domestiques - as was the case for London 2012 selection), we at least, are going to all but rule that out as a possibility for Rio 2016. While not formally part of the selection criteria events, Jodie and Helen started 2016 with Gold and Bronze respectively in Abu Dhabi. Jodie followed up with another win at the Mooloolaba World Cup. Helen is a double World Champion and has finished on the podium in almost 50% of her WTS career races (and is even four from nine in terms of WTS podiums since London 2012, after 18 months of injury). 'Evidence of ability to win an individual medal', in our eyes, has been more than met by both athletes. Let the best athlete go, they have earned that right. To add to the previous point, the last two athletes to beat Gwen Jorgensen in WTS competition were... Jodie Stimpson and Helen Jenkins, who took Gold and Silver in 2014 in Cape Town. Helen finished 11th in Chicago and was a DNF in Rio. Jodie finished 6th in Chicago and was 10th in Rio. No illnesses, injuries, mechanicals or unforeseen external factors impacting the race, please! Let's hope that two hours of racing action will be the decider, not selection policy small print or appeals. We hope that we get a clear and decisive result which leaves little doubt as to which athlete has earned selection. As Jodie said after the race in Abu Dhabi in her post-race interview, "...we're great rivals and she's an absolutely fantastic athlete and I have so much respect for her... Me and Helen are both in the same boat and whoever has the best race in Gold Coast we just hope goes then, the best girl wins, and if Helen beats me in Gold Coast, then Helen beat me in Gold Coast and deserves to go and we can't say any more than that." Is there any small print that could get in the way? Ok, based on everything above - both factual, implied and reasonably assessed (I believe) - could there be anything to get in the way of what seems set to be a purely sporting battle? Possibly. But let's hope not. "Selection of an individual athlete at Phase 4 shall be at the absolute discretion of the 2016 BTF Olympic Nomination Committee. The committee may determine not to select an individual athlete." 2.2 Evidence of a race performance profile that will compliment the athlete(s) race performances profile that have already qualified (i.e. Non Stanford and Vicky Holland), and therefore will enhance Team GB's ability to win medals at the Rio 2016 Olympic Games. Whatever happens on Saturday, and whoever prevails, and whatever the selectors decide... there will be huge disappointment for one of these fine athletes. For Jodie, while Commonwealth Champion in 2014, she's yet to make it to an Olympic Games. For Helen, potentially, this could be her third Olympic Games chance and perhaps an opportunity to overcome the memories of London 2012 where, despite finishing fifth, injury prevented her from fully displaying the abilities that almost everyone had her marked down for, at the very least, a podium finish. It's a pressure situation, a tough challenge for two athletes who I have had the pleasure of following, interviewing and commentating on at events over many years now - in both good and bad times. You would be hard pushed to find two more genuine, professional and hard-working individuals... but two into one doesn't go. And that - for us mortals watching - is part of the attraction. Elite sport is tough, not everyone can win. Indeed, the vast majority of athletes may never win. Helen and Jodie, more than anyone, will be well aware of that, so sincere best wishes to both that they can bring their A-game to race day and let their performances decide the outcome. For the rest of us, we can watch on as fans, supporters, family, friends, media and more. While there is likely to be both celebration and commiserations post-race depending on the result, we can ALL celebrate sporting rivalry at its finest, and as Jodie said, "let the best girl win". Over to you Helen and Jodie. The selectors have yet again shot themselves in the foot, making the selection overly complex. All very reminiscent of 2004 selection. If they'd only gone with one selection from the test event, and then one from the 2015 World Championship final, and one from a designated race in 2016, probably the Gold Coast. The athletes would have been able to plan accordingly and avoided unnecessary stress etc. Now the selectors are dammed which ever way they go, and will be subject to questioning. Was there really any question they'd assign a domestique with such a strong squad, I don't think so. When will British Triathlon learn?